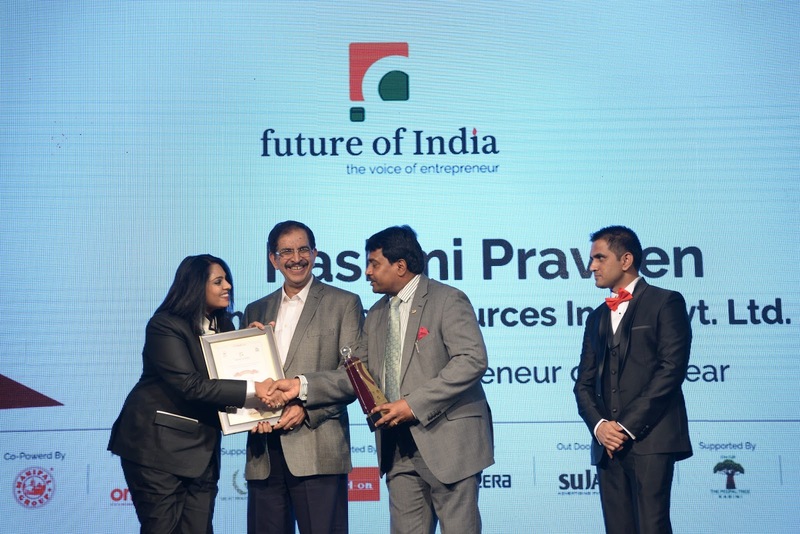 It was a proud moment for me to watch my M.D., Mrs Rashmi Praveen walk up to receive the Future of India Award for “Woman Entreprenuer of the year” for the year 2016. 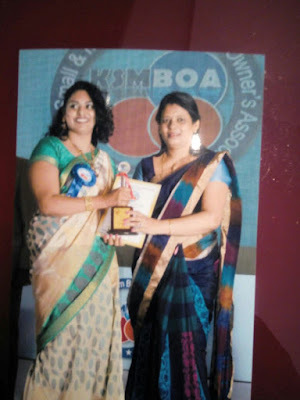 It is nice to be associated with a person who has been awarded for “Innovation in Training Programs by KSMBOA”, an association of SME business owners, besides being one of the finalists among 19000 aspirants in the all India competition held by Economic Times in association with CIIE and Department of Science and Technology (ET Power of Ideas, 2015). The award was organized by 1000 Petals, an event management company in association with CNBC organized the Future of India awards to felicitate Entrepreneurial talent from across India. Applications were invited from entrepreneurs across the country and a stringent selection process was followed right from December, 2015 to evaluate profiles and select deserving entrepreneurs to be awarded. 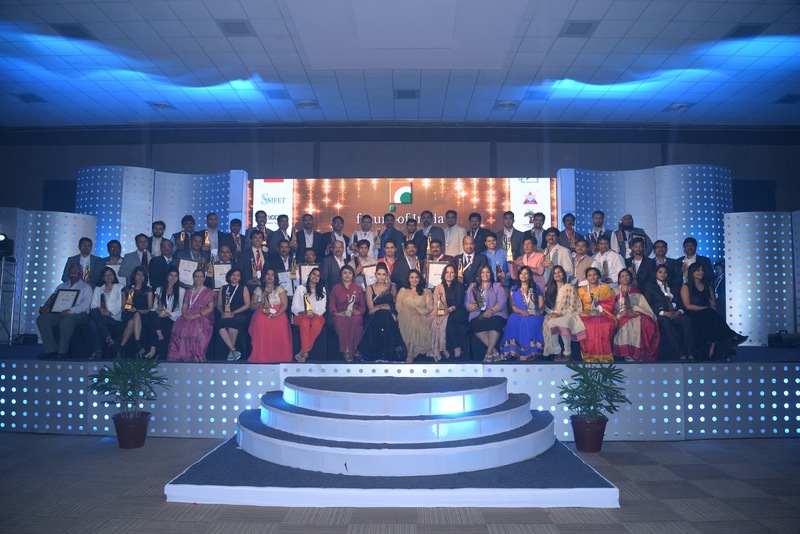 Among 15000 applicants across different award categories, only 60 were awarded. 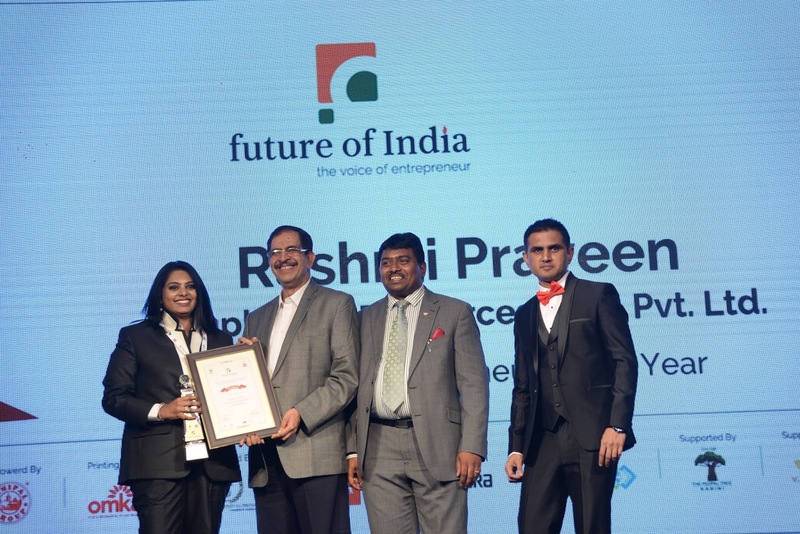 The jury was Headed by Dr.Hari Krishna, Imperial College, Chairman and CEO and consisted of other eminent people from the industry. The felicitation ceremony was conducted with utmost grandeur at The Lalith Ashok, Bangalore on 30th April 2016. The Guest of Honor for the event was Mr.R.V.Deshapande, Honorable Minister for Higher Education and Tourism, Government of India. The event proceeded with a panel discussion named as the Spirit of Entrepreneurship, with eminent people from the industry being panelists for the discussion. The panelists comprised of Mr.Ganashyam Das, Senior Advisor at KPMG, Mr.Sudhakar Pai, Chairman and Managing Director, Manipal Group and Kurlon Group, Dr.Mukram Mulla Khan,Chairman, MK Industries, Mr. Sathyanaraya V.R., expert coach on Entrepreneurship and Mr.Venu Madhav, CEO, Café Coffee Day. The panelists threw light about different aspects about business and entrepreneurship, opportunities available today for budding talent across the country and how globalization of business has led to easy availability of opportunities across the globe. The event was attended by who is who of the industry and had a high entertainment quotient as well. Actress Pooja Gandhi and Ragini Dwivedi attended the event and added glamour to the event. I wish Rashmi and SHRI Pvt. Ltd. to make huge progress in the coming years.